In this work we evaluate a set of lexicon adaptation methods for improving the recognition of foreign names and acronyms in automatic speech recognition (ASR). The most likely foreign names and acronyms are selected from the LM training corpus based on typographic information and letter-ngram perplexity. Adapted pronunciation rules are generated for the selected foreign name candidates using a statistical grapheme-to-phoneme (G2P) model. A rule-based method is used for pronunciation adaptation of acronym candidates. In addition to unsupervised lexicon adaptation, we also evaluate an adaptation method based on speech data and user corrected ASR transcripts. Pronunciation variants for foreign name candidates are retrieved using forced alignment and second-pass decoding over partial audio segments. 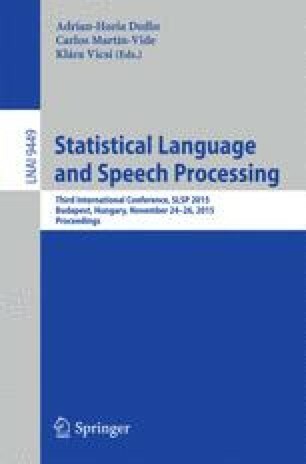 Optimal pronunciation variants are collected and used for future pronunciation adaptation of foreign names. This work has been funded by the Academy of Finland under the Finnish Centre of Excellence in Computational Inference programme. The experiments were performed using computational resources provided by the Aalto Science-IT project.